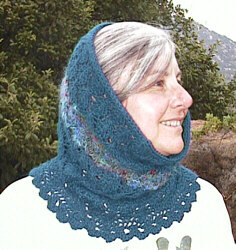 This snug alpaca hood can be a quick gift, or simply a way to try out a luxury yarn. It took me about two days to knit the first one. It is a seamless 30" tube, knitted upward from an edging of a simple narrow lace scallop pattern, incorporating a few inches of a multicolored mohair blend to highlight the face, and finished with an I-cord border. Circular needle, size 9 (US), 18 to 24"
Note: I used all of the alpaca and more than half of the mohair. The photo shows the second hood I made, where I didn't have enough of the mohair for the full width of the contrast band. You could, of course, substitute other yarns. 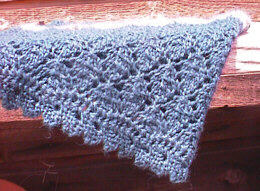 Cast on 5 stitches in the alpaca, and work 32 repeats of Barbara Abbey's "Very Narrow Edging." Bind off the 5 stitches along with the 5 cast-on stitches, which will join the edging into a circle. Turn it so that the rough side of the seam is to the inside. Each repeat of the edging has three loops along the inner edge (formed by the "yo, p2tog" at the beginning of the odd numbered rows); pick up a stitch through each of these 96 loops. Knit the last pick-up stitch together with last of the bindoff stitches, if necessary, to get the correct number. This is the first round of the main pattern, which is Barbara Walker's 12-row Openwork Leaf Pattern. A full repetition of the pattern consists of 8 repeats per round, and 12 rounds. Work 4 repetitions of the pattern (to round 47, actually), and change to the mohair yarn. Work 2 repetitions in mohair (to round 71, actually), change back to the alpaca, and work one repetition. I have changed yarns on round 11 of the repeat, since the color change is less conspicuous at the narrow ends of the diamond patterns. Bind off using a 3-stitch I-cord bindoff, thus: cast on 3 stitches by backward loops on the right needle. Slide these three stitches onto the left needle. *Knit 2, knit 2 together, slide 3 stitches to the left needle. * Repeat this until the entire edge is bound off, then using the tail of the yarn, graft the 3 stitches to the 3 cast-on stitches, and fasten off. This gives one scallop. Repeat 31 more times. include the first stitch of the next round in the double decrease. The gauge I used gives a 30" diameter tube about 15 inches long. This is fairly short and snug. A larger diameter would be fine, I'm sure. If much longer, it would bunch too much around the neck, and some way would needed to make it flare for the shoulders. Permission is granted for noncommercial use of this pattern, provided that my name and email address (jgibson@cts.com) remain with it. You may not charge money for the pattern -- including reproduction costs or requiring a purchase -- or place a copy on any internet site without my explicit permission.